When we talk about communication, it’s so much more than words. Communication is any means ideas travel from person to person. We of course use words, but let’s take a look at all the other levels involved. The bottom level is Attention and Listening which includes the ability to attend to stimuli such as a noise, leaves blowing in the wind or someone pointing to a bird. Children need to have a basic level of attention and the ability to share it in order to engage in the next level which is social interaction and play skills. In the previous issue, we discussed the important role that adult plays in the interaction. At this level, children learn through Play and Interaction with others through cause and effect, imitation, taking turns and other nonverbal communication such as facial expressions, gesture and situational cues. All of this prepares children for Understanding and Expression. Children have to hear and engage with words many many times before they fully understand their meaning and begin to use them. Often people can focus on the expressive language without realising that the understanding comes first. The very last level is often the most noticeable, Speech. This stage starts developing before words through listening and continues to develop until around age 7 years old when most speech is clear. All of these skills are developing at the same time in many ways, but when we work on communication, we work to strengthen each level to support the levels above to support communication in a holistic way. Therapy aims will include both specific skill- learning and natural situations to encourage skills to generalise to daily life. Setting targets which are challenging yet achievable will help support developing skills and support confidence for successful communication. 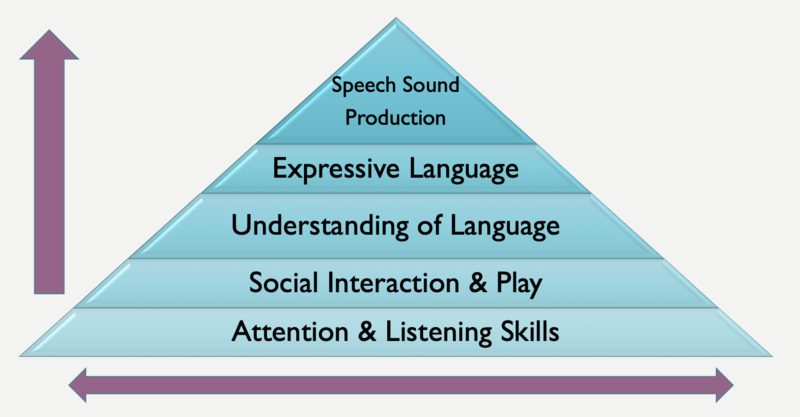 Attention & listening skills are fundamental for communication development. The factors that influence developing attention and listening skills for communication include, sensory awareness, joint attention, and interaction. Poor attention will have an impact on listening, remembering, and following verbal instructions. Our brains help us attend to tasks and select what is important. Every day we use different types of attention skills. Attention helps us select the important stimuli and listening helps us to focus on what we have selected allowing us to process it better. Types of Attention: Selective attention involves being able to select and focus on what is important and block out background noise or other stimuli. Sometimes children have difficulty blocking out background noise or visual stimuli in order to focus on a task. This is particularly the case for children with sensory and auditory processing difficulties such as those with ADHD or ASD. Alternating attention involves being able to switch between activities and have the ability to pick up where we left off with each activity. Divided attention refers to how we can do two things at once. Children with difficulties alternating attention might not be able to move back and forth between attending to a verbal conversation while doing a manual task such as building. Support your child’s listening by helping them develop through simple stages of focusing on something with you i.e. jointly watching leaves blowing in the wind, sustaining attention to watch an entire sequence or showing them a process such watering plants and allowing them to take turns with you in a joint activity i.e. saying ready, steady, go to take turn throwing and catching a ball. Early years educators often point out the value of learning through play especially exploratory play. In fact, whole educational styles are developed with this in mind such as Montessori and Steiner models etc. Play, put simply, means to use something in a certain way that creates a process of enjoyment. So that could be the exploratory play by yourself or play with others. The aspect of play development I am interested in promoting is interactive play. When children play with others especially a key adult who is focusing on their interactive style to adjust and support them well (see previous Salad Days article on Adult-Child Interaction), they are given the opportunities to watch and imitate therefore learning new words and play sequences. The best play situations are when the toys or objects involved lend themselves to a variety of ways of playing. Children’s toys for toddlers often have sets of colours, shapes and numbers etc. which can be very helpful for learning those early concepts, but often it is the everyday objects which lend themselves to imagination and discovery. Some great ways to encourage speech and language development through play are: pretend play i.e. tea party (even if you haven’t got toy cutlery- use what you can find), turn- taking games such as throwing a ball or bean bag, bubbles, chasing and sensory play such as cooking, water and sand play or arts and crafts. These activities involve some basic vocabulary which you can explore together in a meaningful way such as nouns (tea, ball) verbs (squish, catch) and adjectives (big, cold). Exploring new ideas and concepts in an interactive activity create powerful learning opportunities, and the more we enjoy ourselves, the better our brains are able to remember them for next time! With attention and listening as the foundation for developing commination followed by learning through play and interaction, the next stage of communication development is receptive language which refers to the understanding of the words and sentences that we hear and the ability to make sense of them. Children need to hear words many, many times before they can make sense of them. To illustrate this point, we can think of how babies will be listening to adults talking to them for almost a year before they begin to say their first words. The reason for this is that they need to develop their understanding of the words they hear and how they are used before they are able to start using words themselves. Using lots of non-verbal signals help children create rich pictures of words i.e. adults pointing to items as they are labelled for the child as well as using visuals such as objects and facial expressions. Babies learn how to read these signals from very early on even from their first smile! So understanding really starts a lot earlier than speaking which is why it is so important to talk to your baby face to face. Many parents ask lots of questions to try to assess their child’s language development, but we recommend rather than asking lots of questions, you can comment instead. Commenting simply means describing what you can see using simple words aimed at the child’s level to understanding i.e. single words i.e. “car” for under 12 months, 2 joined words i.e. “big car” for over 12 months and continuing to longer sentences as they continue to progress. Remember to use all the nonverbal signals you need to in order to ensure a child can understand what you mean such as pointing, gesturing, signing etc. All of this will support understanding which will pave the way for the expressive language to come. Once children have reached a level of understanding of a bank of words, they often try to imitate some of the words they understand. You may notice that your child will be able to look for an object by name such as “go get your shoes”, but they have not yet said the word “shoes”. However, common first words are often words such as “mama” or “dada” or other common words that a child has heard the most during their first year of life. Although they are listening from birth, first words generally don’t emerge until a child is around 1 year old. Once children are using a large selection of words (approximately 200 words) they can begin joining 2 words to make a short sentence i.e. “mama drink” etc. Most early communication is about meeting needs so requests for milk, food etc. are highly motivating. Children also begin to label what they see, so the more words they have, the more efficiently they can express themselves. When you want to encourage children to maximise their expressive communication, you should expand what they are already saying by modelling back what they say and adding 1 word so that they can hear a model of what they are trying to say but with a little bit more. So if your child says, “bus”, you can model, “big bus” or “bus gone”. Soon they will be making sentences with the additional words you add. Typical expressive language progresses from single words at 1 year, 2-word phrases from 2 years and 3-word phrases from 3 years old and beyond. If you are concerned about your child’s expressive language, seek professional advice from a speech and language therapist who will assess your child’s understanding and expressive skills as well as social interaction and attention which all underpin expressive language. When children start off speaking, most of their words are not clear and this is normal and often very endearing. Children making errors on sounds has a typical progression and we expect similar errors at different stages of development with most speech being clear by age 7 in typical development. There are pronunciation errors that we expect as well as those we do not expect. For example, many children will produce the wrong sounds in certain places i.e. tat for cat (this error process is called fronting), dun for sun (error process called stopping). When children make errors, they need support to listen to the correct production again and again to encourage them to move through these error stages therefore there is lots you can do to help. However, it can be difficult to determine whether children are having trouble with the words as well as pronunciation. If you have trouble understanding your child, seek advice from a speech and language therapist in order to determine if their speech sound errors are within normal development or if additional support is required. In the meantime, here are some tips: Model sounds back correctly without telling your child they have said it wrong. Saying, “Yes its a “bussssss” emphasising the sound they need to fix without the pressure of asking them to say it again. They will definitely have a go if they feel confident to do so. Confidence is key. If a child feels confident, they will likely take more of a risk and that gives you a chance to model it back again even if they still get it wrong. Sing songs together to support awareness of sounds and rhythm and Play Sound/Rhyming Games such as I Spy to boost their awareness of sounds as they develop. Have fun playing with sounds! Have another look over the pyramid now that we have gone through the stages. Development continues from the foundations up, but also development within each area of communication continues to develop as children grow. This is important to remember as just because attention is not perfect, does not mean children can’t learn words, but the more developed their attention, the better it is able to support learning new words. Often the area that stands out the most may be above the level that really needs a lot of support so, when we assess children’s speech and language, we have a look at whether the underlying skills are adequate to support development in the area that may be the most obvious area of difficulty which parents and carers have highlighted. This is why within therapy we work on strengthening underlying skills in order to maximise improvement overall. Luckily because children learn through play, we all get to have fun in the process.